FIFA 18 Pro Players cards are the most unknown cards of the game. Let’s learn something more about these very special FUT 18 cards assigned to professional football players. What are Pro Players Cards? Pro Players cards are assigned by EA Sports to professional football players that play FUT 18 in a bid to make friends and gain exposure. When EA Sports have an existing relationship with a player and knows that he play FUT, they offer him his own and unique special card. They also send FIFA 18 Pro Players cards to famous players who ask them for it. 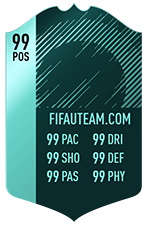 These cards were introduced in FIFA 12 and Liverpool’s Jose Enrique was probably the first professional player to use it. He owned a heavily improved black card that appeared similar to a Team of the Week release. But it wasn’t. Just like with him, also the Joey Barton’ card was sold by a fortune in the transfer market. Because of that, in FIFA 14 EA Sports made these cards “non-transferable”. Each professional player chosen by EA has his own Pro Player card. This cyan card is unique and cannot be sold. That is, you will not find them in packs neither in the transfer market (as it happened in the past). If you play against someone with one of these cards that’s because you are playing against a real professional football player. When FIFA 18 Pro Players Cards will be available? FIFA 18 Pro Players cards are only available for professional football players. If you don’t play professional football in a top-quality club, then you will never get one. These cards are not released all at once. Electronic Arts don’t announce them but they release these cards through the year. How big are the ratings and stats boosts? All FIFA 18 Pro Players Cards are rated 99, regardless of the level or rating of their regular FUT card. This has always been the case since they were first introduced in FIFA 12. They also have unrealistically high attributes, that usually are greater than 90.
Who are the professional players who already got one of these cards? What happens to the Pro Players cards’ prices? These cards are unique. In other words, they can not be placed in the transfer market. For that reason, they have absolutely no effect in the market or FUT economy. 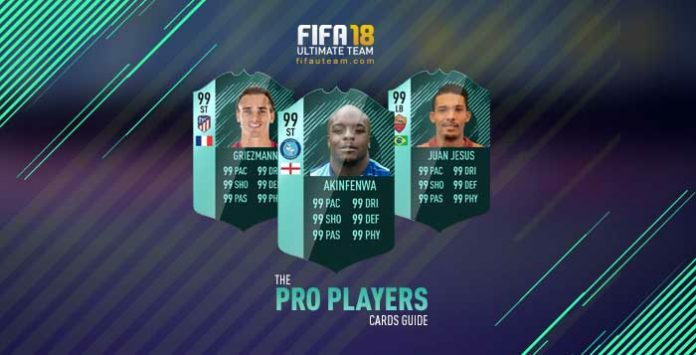 Q: What are FIFA 18 Pro Players cards? A: FIFA 18 Pro Players cards are unique untradeable cards assigned by Electronic Arts to professional footballers who play FUT. If you play against one of these cards, you’re playing against a real-life pro or challeging his featured squad on Squad Battles mode. Q: Who chooses the players for the cyan cards? Q: How long are Pro Players cards available in FIFA packs? A: They are not available in FUT packs. Never. Q: How can I get one of these cards? Q: Are FIFA 18 Pro Players cards available in the FUT Draft mode? A: No. FIFA 18 Pro Players cards will not be available in FUT Draft. The owners will only be able to use their unique cards in regular FUT matches, like FUT Seasons. You can also play against one of these cards when challenging the featured squad of Squad Battles. Thank you. We added him now. My card is in fifa. i play for Bohemian FC in ireland Airtricity League. How do i get my pro card? Hi. Nice to meet you. We don’t have a direct contact for that. You can try contact the EA Support. the player’s of FC Ingolstadt 04 (2nd Bundesliga, Germany) would like to request professional player cards. Do you have a direct contact for us? Every week I receive several requests but unfortunately, I don’t have any direct contact. Usually, I suggest contacting the EA Support. I will try to ask them a direct contact and if I got success, I will email you, OK? Thank you. Hi. Nice to meet you. You need to make part of the FIFA 18 database to have the chance to request a pro card. I’m a profisonnal football player in Sweden ! I wonder how can I get a pro player card ?? Hi. Nice to meet you. Try to contact EA directly.